The Northwestern Medicine Lake Bluff Criterium and Block Party returns again with big crowds and tons of fun! 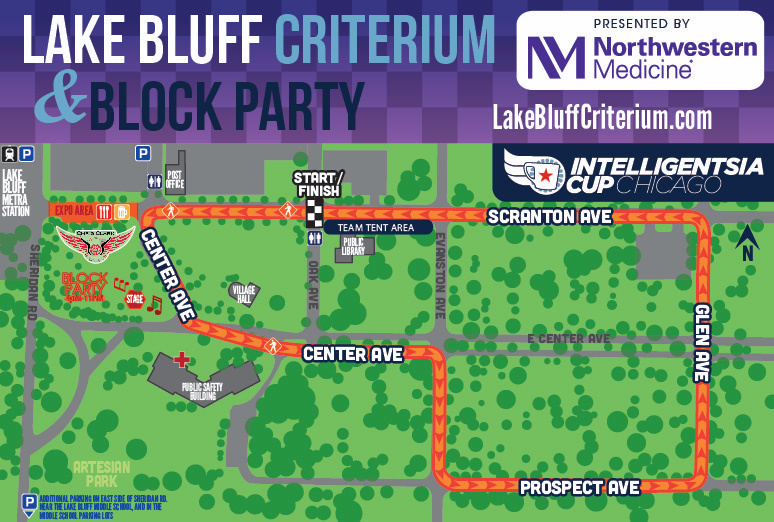 Northwestern Medicine is proud to serve as the principal sponsor and title healthcare sponsor for the 2019 Northwestern Medicine Lake Bluff Criterium & Block Party. We are thrilled to bring this premier event to our community for the seventh year and invite our neighbors to join us for family fun and world-class cycling. The Northwestern Medicine Lake Forest Hospital team will provide first aid to cyclists as needed. Bicycling is a fun sport that suits all ages and we hope this event inspires community residents to be active and live a healthy lifestyle. Course marshal volunteers needed — sign up today! GPS Directions Parking is located in the METRA parking lot and in lots north of turn one.